The Nationalist Party’s fortunes seem to have got worse since January as it continues to lose voters to the Labour Party. A stronger swing was recorded this month with 9.1 per cent of PN voters in the last election saying they would switch and vote Labour if an election was held tomorrow. In January, a similar survey commissioned by this newspaper had established the swing was 5.8 per cent in favour of Labour. 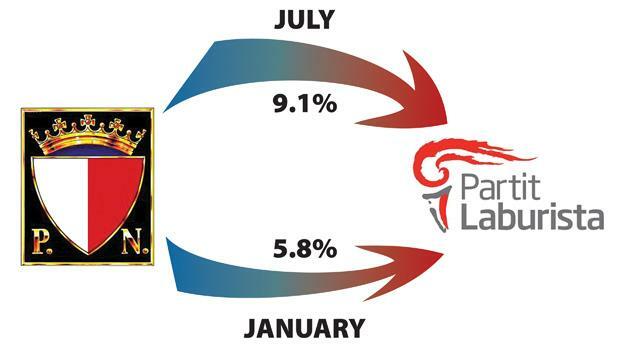 A Malta Today survey last month also registered a shift of 10 per cent from the PN to Labour. The significant swing is probably the PN’s biggest worry, especially in the context of an election that was won by a very slim majority four years ago. Almost 18 per cent of those who voted PN at the last election said they were uncertain on how they would vote in an election –a nd 5.7 per cent said they would not vote at all. The numbers contrast heavily with those for the Labour Party. The number of undecided Labourites stands at almost seven per cent and the number of 2008 Labour voters who would vote PN today is insignificant. Only 1.7 per cent of Labour voters said they would not vote if an election was held tomorrow. The Misco International survey has a margin of error of +/- 4.5 per cent. Almost half of the people surveyed have said they would favour an early election. With 48.6 per cent of respondents keen to cast their vote, the number is almost six points higher than in January when a similar survey found 42.7 per cent wanted the country to go to the polls early. However, 34 per cent are against, with 16 per cent saying they are undecided. Asked when it should be, 20.1 per cent said now and 24.9 per cent indicated autumn. 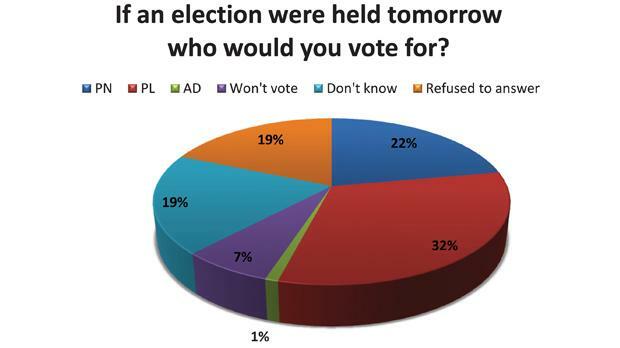 PN voters are increasingly in favour of an early election. Whereas in January 13.1 per cent of PN voters wanted an immediate election, the number has now risen to 24.6 per cent. While 63 per cent of Nationalists did not want an early election, 12.4 per cent are uncertain. As expected, 89 per cent of Labour voters favoured an early election, an increase of more than five points since January. Only 4.3 per cent are against an early election and 6.8 per cent were undecided. Alternattiva Demokratika voters are relatively split, with 51.7 per cent wanting the Prime Minister to call a premature poll. Prime Minister Lawrence Gonzi’s uphill struggle is twofold: not only is his party going through a tough time, but satisfaction with his leadership has also dropped. 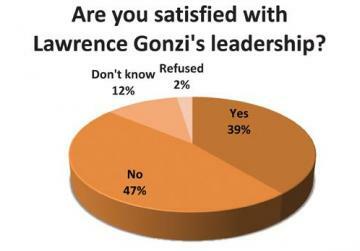 Asked whether they were satisfied with Dr Gonzi’s leadership 47 per cent said No, against 39 per cent who said Yes. Another 11.5 per cent were undecided. A deeper analysis shows that 19.7 per cent of those who voted PN in the last election were unsatisfied with Dr Gonzi’s leadership. However, the views of new voters are encouraging for Dr Gonzi. Almost 61 per cent of new voters were satisfied with his leadership as opposed to 33.3 per cent who were not. Only 5.8 per cent were uncertain on how to rate Dr Gonzi’s leadership. When it comes to Labour leader Joseph Muscat, who is yet to hold office, 34.2 per cent were satisfied with his leadership while 29.2 per cent were not. 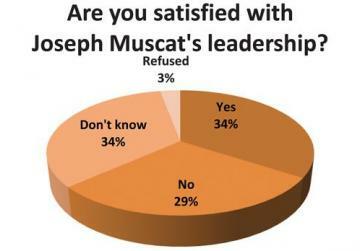 However, Dr Muscat seems to present more of a challenge for voters since 33.7 per cent were undecided on their view about his leadership. The level of uncertainty was also high among Labour voters and new voters. New voters were split down the middle about their views on the Labour leader’s leadership. While 39.7 per cent said they were satisfied, 40.8 per cent were not. 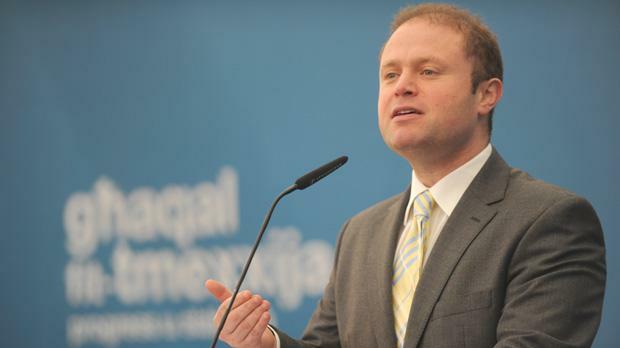 The level of uncertainty among new voters about Dr Muscat was higher than that for Dr Gonzi. Almost 20 per cent of new voters did not know how to rate the Labour leader’s leadership. A quarter of Labour voters also did not know whether they were satisfied or not with his leadership. But the figures also show that Dr Muscat has made inroads among Nationalist voters with 13 per cent of them expressing satisfaction with his leadership. At the opposite end, 5.7 per cent of Labourites said they were satisfied with Dr Gonzi. New voters are a significant battleground for the political parties and despite its showing in the polls the Nationalist Party still holds sway in this crucial segment. The survey showed that from those ineligible to vote in the last election, 31.8 per cent said they would vote for the PN, almost double those who would choose the Labour Party. Labour attracted 16.4 per cent of new voters while Alternattiva Demokratika have 5.8 per cent. However, new voters were also characterised by a high level of uncertainty with 32.3 per cent saying they did not know how they would vote if an election were held tomorrow. 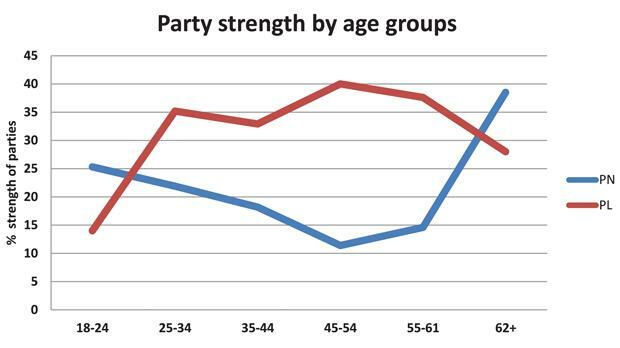 A deeper analysis of respondents by age group confirms the attractiveness of the PN to younger voters and the elderly. Just over a quarter of those aged 18 to 24 would vote for the PN if an election were held tomorrow while 14 per cent would vote Labour and 3.4 per cent AD. However, the tide shifted towards Labour in all age groups between 25 and 61 with the PN gaining the upper hand again among those aged 62 and over – its strongest result. The Labour Party’s strongest showing was in the 45 to 54 age group where it commanded 40 per cent of the vote. In the space of a month, parliamentary motions moved by the opposition have forced former Home Affairs Minister Carm Mifsud Bonnici and Malta’s EU envoy Richard Cachia Caruana to resign. But opinion poll respondents are divided over whether the Labour Party was justified in putting forward the two motions that eventually were supported by two government MPs. While 36.4 per cent believe the PL was not justified to ask for Dr Mifsud Bonnici’s resignation, 33.2 per cent said Labour was justified in calling for the EU envoy’s resignation. More than 38 per cent said they did not know whether the motions were justified or not. A breakdown of figures based on how people voted at the last election showed 14 per cent of Labourites felt the Mifsud Bonnici motion was not justified, as 5.3 per cent of Nationalists agreed with it. In Mr Cachia Caruana’s case, 13.2 per cent of PN voters said Labour’s motion for his resignation was justified while 3.7 per cent of Labourites said it was not. And with the PN condemning three of its MPs for not toeing the party line when voting on the resignation motions, questions have been asked as to what motivated the renegades to act the way they did. 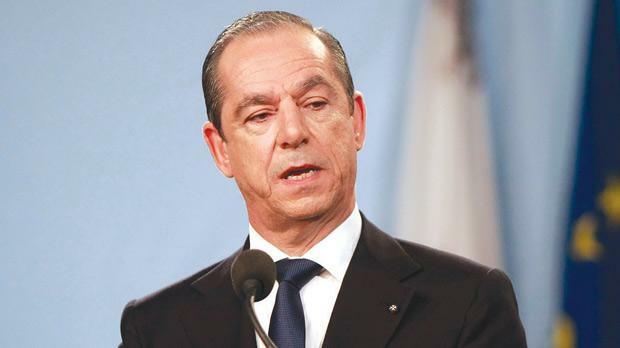 Franco Debono, who voted with Labour to oust the home affairs minister, Jeffrey Pullicino Orlando, who voted with the opposition to oust Mr Cachia Caruana, and Jesmond Mugliett, who abstained on the Cachia Caruana motion, have repeatedly said their actions were not motivated by personal agendas. But few people seem to believe their actions had the national interest at heart. On average, between 16 and 17 per cent of respondents thought the MPs were driven by national motives. In Dr Debono’s case 41.1 per cent said his actions were personal while 24.2 per cent believed he had personal and national motives. In Dr Pullicino Orlando’s case, 38.9 per cent said his decision was driven by personal motives while 18 per cent said his vote was based on a mixture of personal and national motives. On the other hand, 31.2 per cent attributed personal motives to Mr Mugliett’s actions and just 13.5 per cent said his actions were determined by both personal and national reasons. But the three MPs have also failed to convince those who voted PN in the last election that their actions were not personal: 54.3 per cent believe Dr Debono’s mo­tives were personal, 59.1 per cent said the same for Dr Pullicino Or­lando and 46 per cent for Mr Mugliett. Labour voters were generally evenly split on the matter.